Get 30% Bonus MC when you Purchase MC! Check the chart below for the bonus MC, then head on over to https://mwomercs.com/profile/credits to get your MC package! Check the chart below for the bonus MC, then head on over to https://mwomercs.com/store/gifts/premium-time to gift an MC package! NOTE! The Player who redeems the gift code gets the MC and the Additional Content. ALSO! YOU MUST REDEEM DURING THE PROMOTION TO GET THE ADDITIONAL MC! YES! You can purchase a gift Code for yourself and redeem on your own account! For the Gifting promo, the additional MC is Granted on the hour following your redemption. 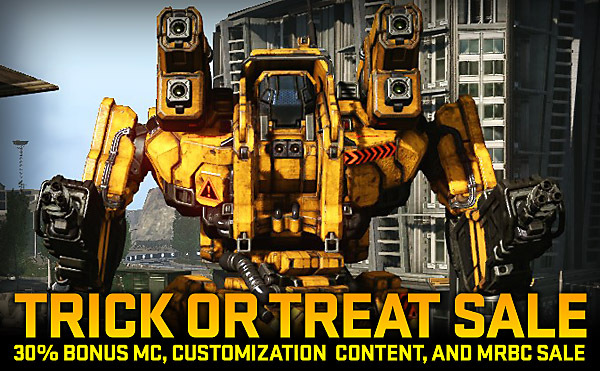 50% off of Customization Items! Select Cockpit items, Decals, Patterns, Colors, and Bolt-Ons are on Sale!